Some say, she probably should have square eyes by present day. Some say, she should “do more valuable things with her time” Some say, just because the tired fact she was a girl – should be outraged and stay away from the industry. Luckily she didn’t listen. A loooong time ago – 1984 to be precise – a kid got to sit down by the computer with her father by his brand new IBM AT. She was introduced to the magnificent and spellbinding world of AllyCat in minty green, nightshade purple and black and white. The girl grew; learning there where many lives to be lived in endless adventures in countless worlds with no limits. Some say, she probably should have square eyes by the present day. Some say, she should “do more valuable things with her time” Some say, just because the tired fact she was a girl – should be outraged and stay away from the industry. Luckily she didn’t listen. I see myself as a gamer by heart. The games I’ve played are too many to be listed right away so the ones mentioned below are just a small taste. 🙂 I started out with AllyCat and Pac-Man – I remember being absolutely TERRIFIED of the spiders! Early I tried, (with different results due to language barriers) Hugo’s House of Horrors, Commander Keen, Leisure Suit Larry, and Hillsfar. When I wasn’t playing myself I often sat by my uncle when he took over the world in Sid Meier’s Colonization or advanced in Doom. We used to eat blueberry pie as he taught me the game back story. Good times. My baby sister grew and I had a steady side-kick and co-op player in games like Whacky Wheels and The Treehouse. I remember her equal parts hiding and cheering me on all through Diablo 1! Whoever said gaming was unsocial just don’t get it. Luckily for me, my best friend also had a PC early on. We sat in her parent’s workspace, put a blanket over the window and lost ourselfs in Myst, Alone In the Dark and other horrors – just as often as we played Jill in The Jungle, Lost Vikings, Grim Fandango and Black & White. Fortunately, we also got to try the occasional Super Mario, Yoshi’s Island and Chip’ n Dale Rescue Rangers at friends houses, but being kids remained true to whatever games were released to PC for a long period of time. Time had passed well into the 21st century when I finally bought my first console; my beloved Xbox 360 which later on lead to the Swedish launch date purchase of Xbox One. Nowadays I and some friends have introduced “StarCraft II-Mondays” and kill each other for fun. (We usually switch it up with HOTS and Overwatch.) Then there’s the sporadic hot-seat match in Heroes of Might and Magic – HOMM3, obviously! 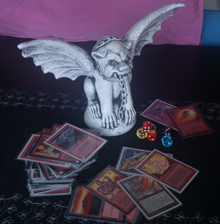 – and recently a recurred passion for getting together and playing board games and RPG’s like Dungeons and Dragons. Besides that, I often play single player console or PC, simply because I don’t have that many online friends anymore and it’s easier to get lost in a story be it a book or a game if you’re not distracted by someone else. I constantly struggle with every gamers bitter-sweet dilemma: Too many good games – too little time. Assassin’s Creed: Black Flag, Shadows of Mordor and Tomb Raider: A Survivor is Born are all great games with captivating sceneries and interesting gameplay and motors. I would also be lying if I didn’t admit to enjoying the car chases, story, and humor in GTA V and WatchDogs 2 – even though there are tons of ethical discussions that could be held with those games in mind. Proud gamer and geek. Digital native. Glass always half full. Get an almost unhealthy thrill from completing achievements - be it in game or IRL. © MsGamer 2011-2019. All Rights Reserved. Content thieves will be cursed.